Character design has always been a field of constant exploration and unlimited imagination. 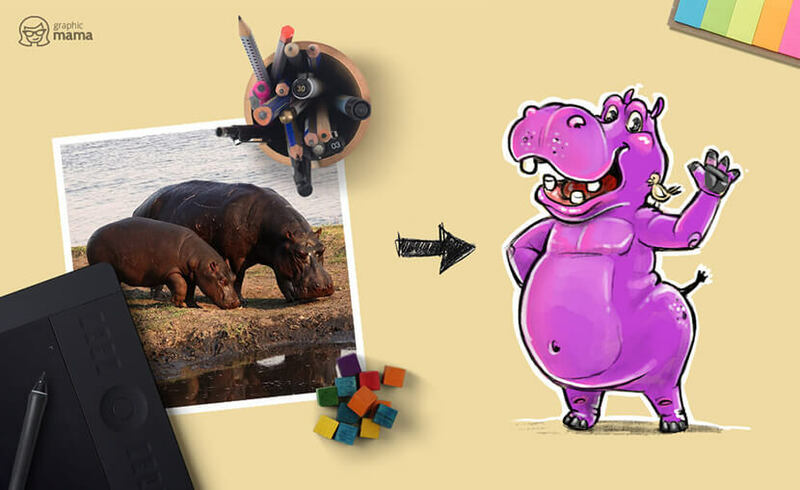 Here at GraphicMama, we have been experimenting with character design a lot and recently, we have discovered a new passion: designing hippo cartoon characters. Hippos may not be the first animal to think of when it comes to character design but their interesting appearances suggest creating quite colorful personages. 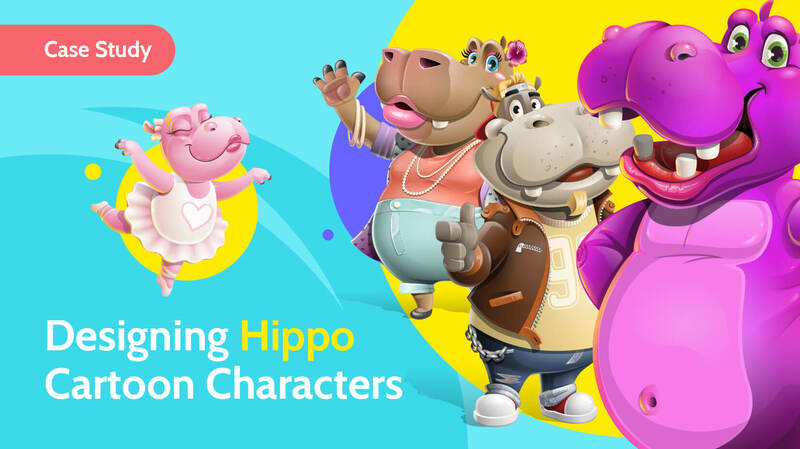 We’ve certainly had a lot of fun designing hippo cartoon characters and wanted to share our experience with you. Read on. Cartoon character design does not strictly follow real-life proportions. 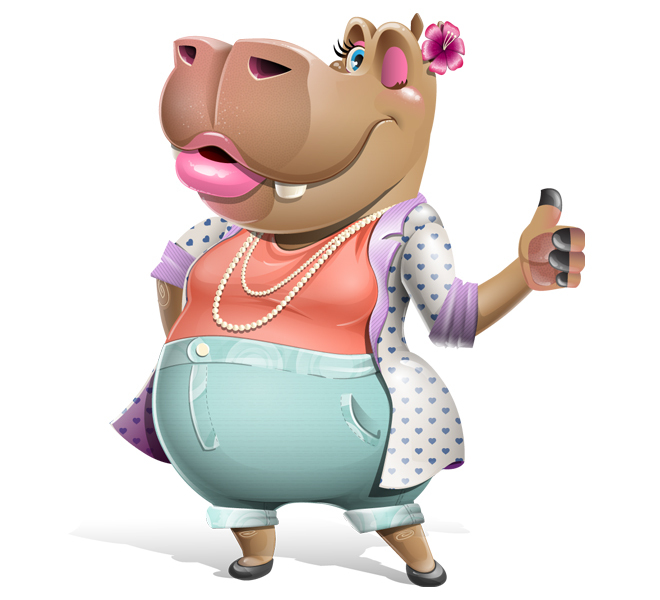 When it comes to designing hippo cartoon characters or other animal cartoon characters, the designs usually combine distinctive features of the particular animal with some specific human characteristics. Тhe first phase of creating a character design of a particular animal is to identify its physical features that distinguish them from the rest animal species. So, what did we find out? Hippos are heavy and bulky animals whose skin is purplish-grey with pink areas and covered in very little hair. Unlike their big bodies, their legs are small and columnar. They can’t jump but they can actually run! Most of the time hippopotamuses move slowly on land or submerge in water. Hippos can get really, really heavy and water helps them reduce the burden of their weight. In order for them to breathe unobstructedly, their ears and eyes are anatomically placed in the upper part of their heads facing sideways, and their nostrils – on the upper side of their snouts. A hippo’s mouth can open up to 180°. (What a jaw!) They usually feed on grass but their bite can be quite deadly. Hippos have incisors, sharp canine teeth, and molar teeth. Animal cartoon characters, hippos including, are normally illustrated with characteristics inherent to humans. The idea of cartoon hippos behaving like humans is that they become relatable and appealing… to a human audience. 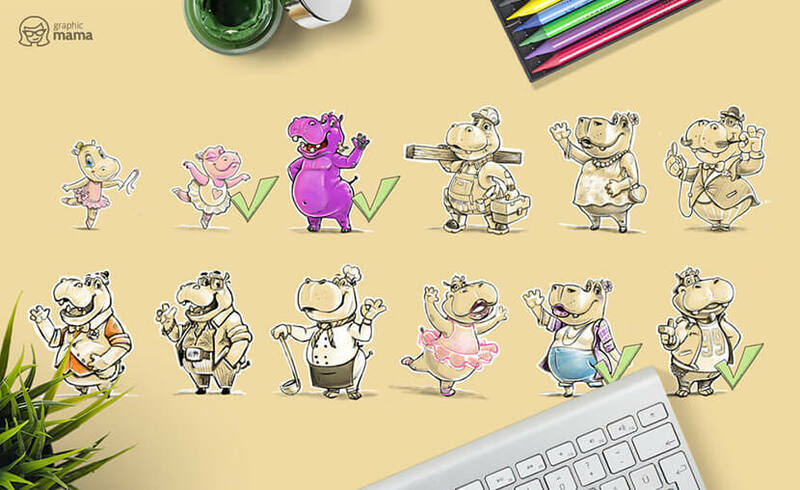 Hippo cartoon characters are depicted standing up. 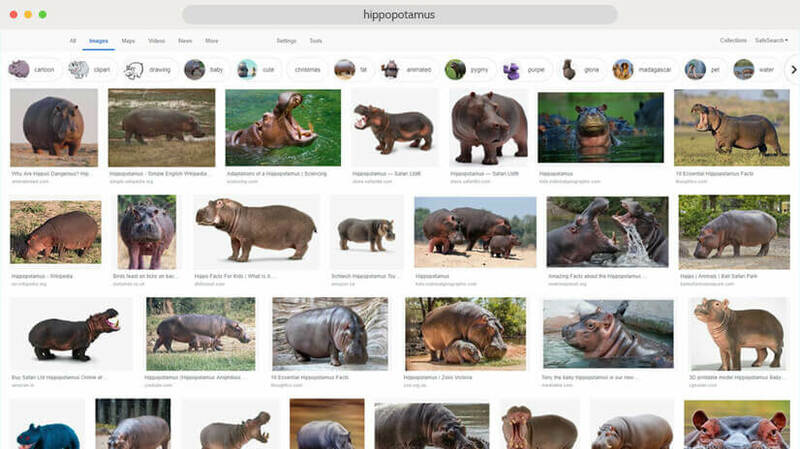 The first humanized characteristic you’d notice when you compare an actual photo of a hippopotamus to a hippopotamus cartoon character is that the latter is depicted standing up. Unlike hippos, humans have been walking this Earth on two feet for thousands of years. 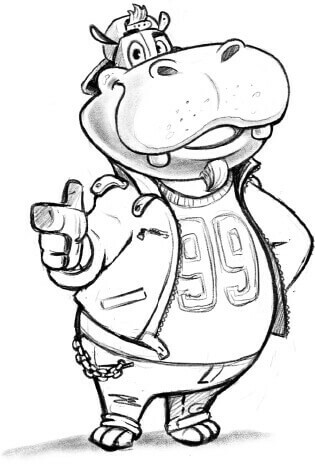 So, illustrating a hippo cartoon character having two legs and two arms is the first step to achieve a resemblance. 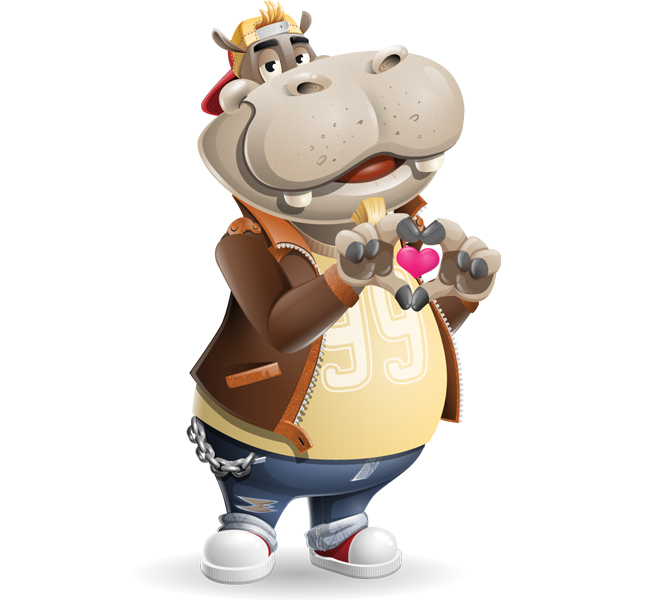 In hippo cartoon character design, some features are exaggerated while others – softened or entirely skipped. In their nature, hippopotamuses can become very dangerous and aggressive. Their behavior is unpredictive and they can easily attack without thinking twice if they feel a threat. Well, we can’t have that for a character! Cartoon characters are supposed to attract people, not push them away. 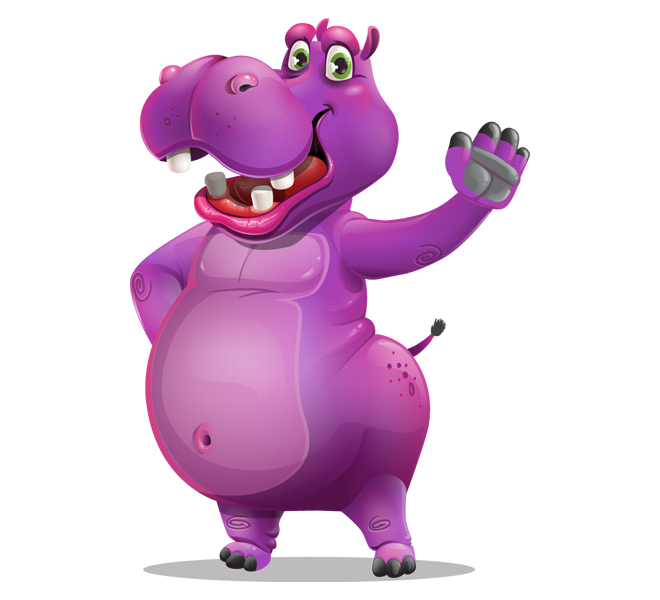 In hippo cartoon character design, you will see a quite friendly and lovely appearance that people would easily fall for. Such a look is easily achieved by making a reference to what a person considers cute. Big bright eyes, a genuine smile and of course – chubbiness. These features add up to the cuteness of the overall look. Sharp teeth, which are considered dangerous, are simply not illustrated. Instead, when the cartoon hippo’s mouth is open, you will only see molar flat teeth. The skin color is cleared out (no stains) and illustrated in eye-pleasing hues of pink, purple and grey to make it look healthy and appealing. Hippo cartoon characters express emotions. Just like humans, cartoon characters go through different situations in life. The ups and downs which are familiar to the viewer make it easy for the spectator to identify with the personage. As humanized fictional personages, hippo cartoon characters react with emotions to daily situations, as well. Basically, when developing a personage, we design an array of mouth and eyes positions which combined make up different facial expressions. As a result, the cartoon character appears to be expressing different emotions. These could be happy, sad, surprised, angry, confused, scared, confident, etc. 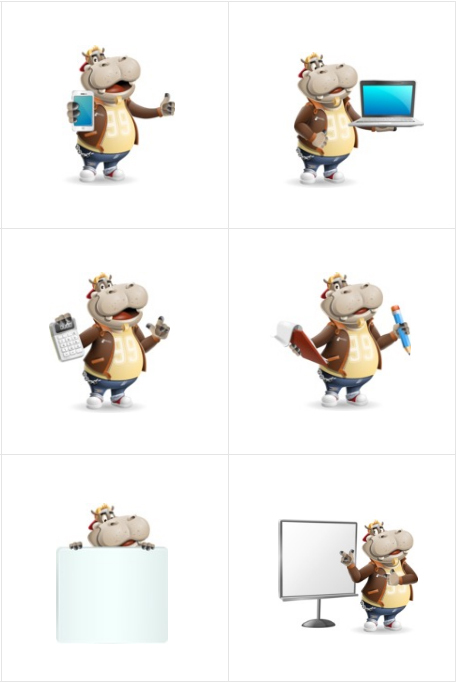 Hippo cartoon characters have professions and jobs. 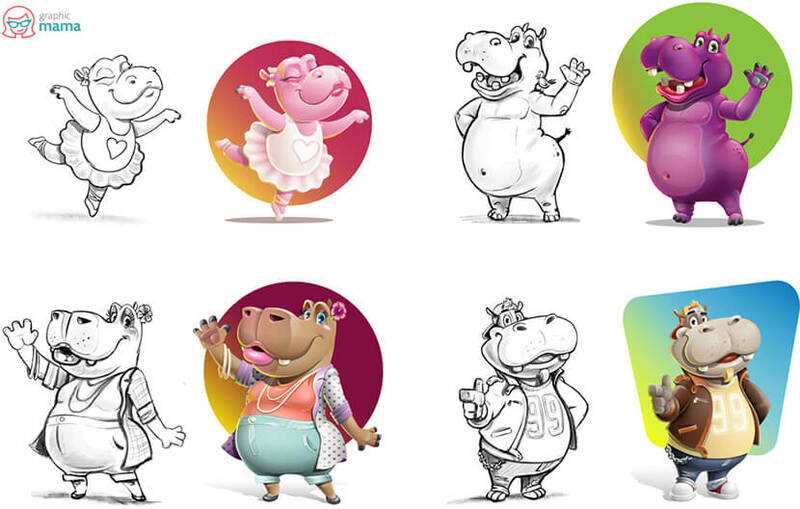 To make the character even more relatable, we develop various plausible professions for the cartoon hippo design. The professions are based on what people search for and what would complement the characters’ looks in general. For one reason or another, ballerina hippo cartoon characters are among the most preferred cartoon looks for this bulky animal. The image of a ballerina is usually a skinny, flexible and graceful girl which makes the ballerina hippopotamus combination sound like an oxymoron. However, when it comes to cartoon character designs, you will quite often encounter oxymoron personages whose purpose is simply to be funny. 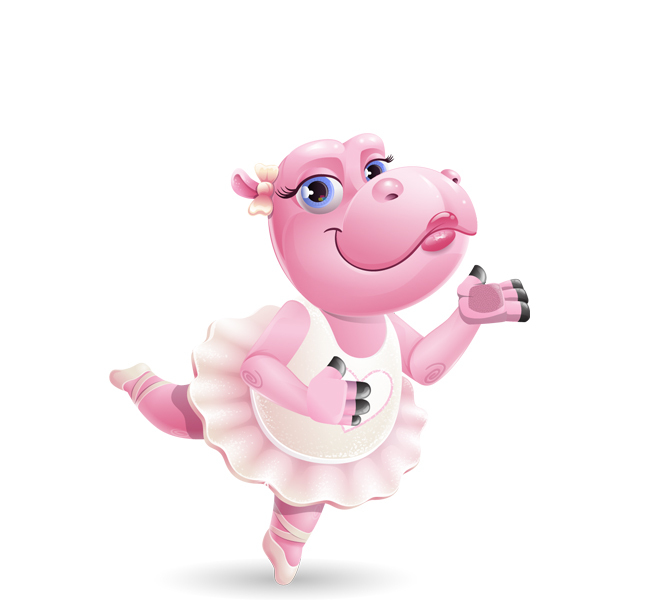 A ballerina hippo character is indeed a comical kind of a personage which has gained popularity ever since such dancing hippo cartoon characters appeared in the Disney film Fantasia. 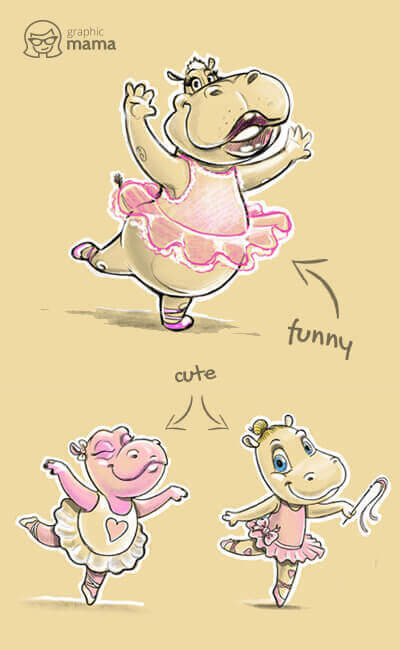 We wanted to make our ballerina hippos appealing, friendly, and cute rather than comical. This is why we’ve decided to focus on little girls hippopotamus ballerinas in tutus and full ballerina costumes. Ballerinas turned out to be the most famous profession for a hippo cartoon character but we had to dig deeper to find out what other professions would be suitable for such colorful personages like hippos. We experimented with several different looks that felt in harmony with the specific features of a hippo cartoon character: big plump bodies, big muzzles, short legs. Here are some of the looks that we found grasped the vibes of a hippopotamus character: a mechanic, an aristocrat, a mobster, and a chef. 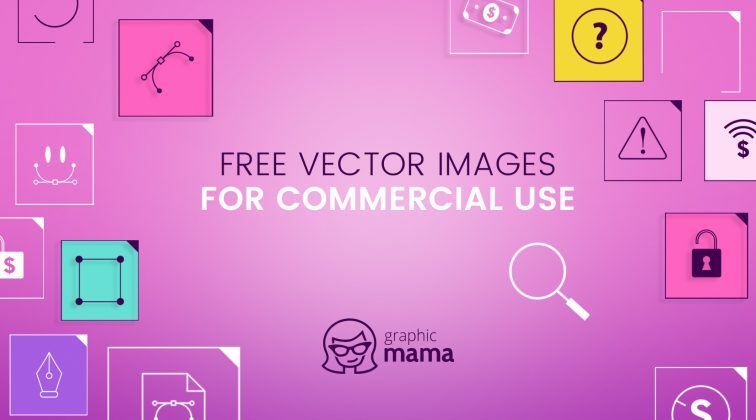 After developing enough concepts of hippo cartoon characters, we analyze them and pick a few strong concepts to vectorize. Our most important criteria is functionality. We consider strong concepts those character designs that our audience would find the most useful. This means they can easily be used in projects of different natures, no matter if it is a business project or a project for children (yes, we aim for that kind of diversity). In addition, we always make sure to vectorize at least one female and one male character that look good together. Very often, our clients prefer using a pair of characters for one project. the girl and the boy hippo cartoon characters which can easily be a couple and used in the same project. The next step is to take the chosen sketch designs into Adobe Illustrator: our preferred software for vectorizing. 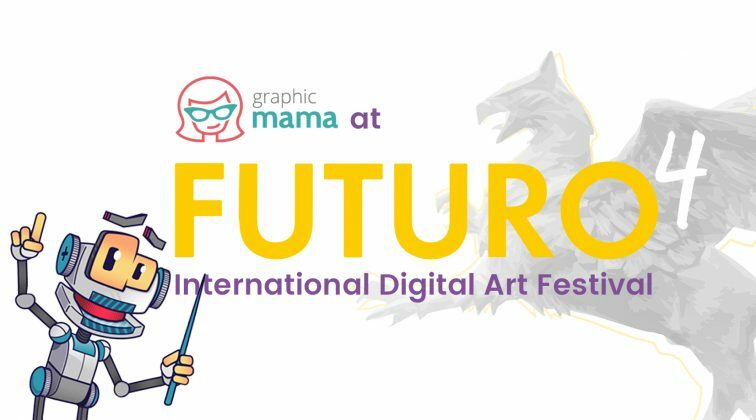 And here is a cool video presentation of the character designs we’ve chosen to vectorize. Looking good, right? We rarely design a cartoon character with a specific color scheme on our mind. More often, we experiment with colors. Even if we do have a particular color scheme on our mind, there are many different color variations of the same color scheme. In this case with hippo cartoon characters, we did experiment with colors a lot. The purpose of developing different color versions is to identify these specific colors that would grasp the personality of the character and optimize its functionality at the same time. These are the color versions we did for the hippo boy cartoon character. We ended up choosing the first one. For each character design, we create a rich set of poses that convey a variety of emotions and concepts. Each pose is functional and can easily interact with the rest of the design. Besides creating different emotions, we include additional items in the compositions to illustrate different situations and experiences. Usually, these are laptops and mobile devices, presentation boards, sale signs and shopping bags, arrows and symbols, and many more. Here are several examples of emotional and conceptual poses. The idea is to make these poses functional for various projects. No matter if you need them for a business presentation, a website mascot, a children’s project, or anything else – we strive for diversity. Of course, all poses are vector-based, so each can be easily edited in vector editing software to meet the specific needs of a project. 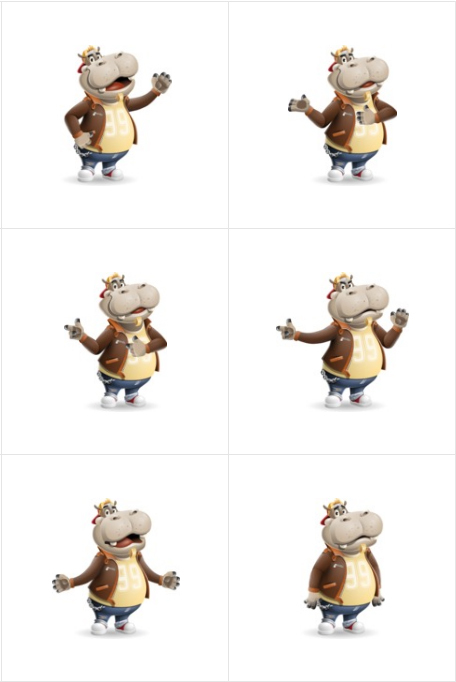 Wanna see all poses of the hippo cartoon characters? 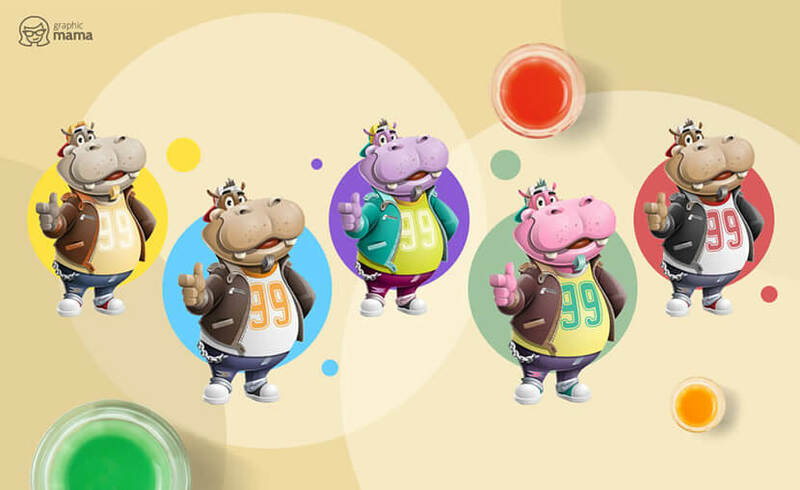 The hippo cartoon characters are ready! As final words, we’d like to say that it has been a real pleasure and fun developing character designs of these beautiful majestic animals. 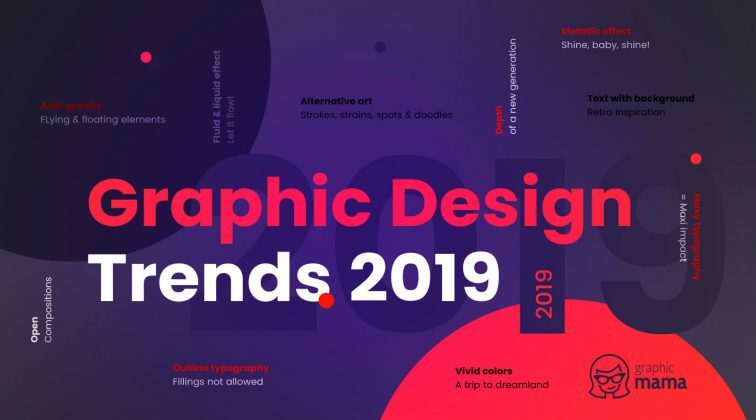 The final designs turned out to be appealing and friendly, suitable for a wide range of design projects and presentations. Wanna share your own thoughts? We’d like to check out your opinion in the Comments section below.